I finished my Pixel Pumpkin in a Pixel Heart Quilt and pattern today. The fabrics for the pumpkin and heart are from my stash and the background fabrics were purchased from Studio 39 Fabrics and Clinton Modern Creative. This pattern can be found on Daydreams of Quilts.com and Etsy. 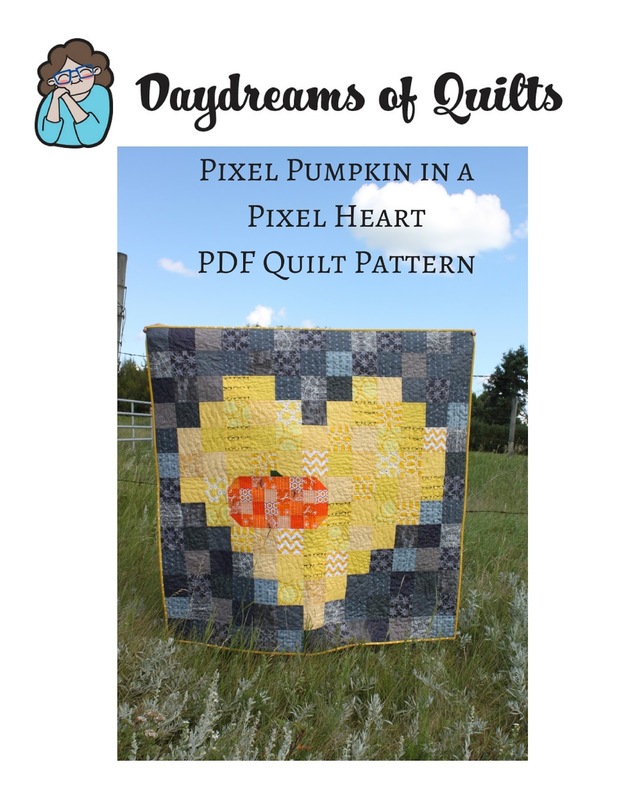 This is another quick and easy beginner friendly 52" Pixel Heart Quilt in my year-long series of Pixel Heart Quilts. This one celebrates fall and is a great way to welcome the Autumn Season into your home. It's a lovely day for quilt photos today! I backed it with a wideback of Carrie Bloomston's Newsprint fabric purchased from Mad About Patchwork. I quilted the pumpkin with vertical lines in orange 50 wt. Aurifil thread and the heart with wavy lines in yellow 50 wt. Aurifil thread. The background is stipple quilted with grey 28wt. Aurifil Thread. I am so happy to have this quilt and pattern finished today! Thank you for stopping by to see it! Blog Navigation and Social Media Links in case you cannot see my blog buttons. Please feel free to follow anywhere you like to hang out online and pinning on Pinterest is always welcome.